Realice un recorrido en autobús con observación de animales en el Parque Nacional Banff, y admire la increíble flora y fauna del parque al atardecer gracias a esta excursión para grupos pequeños de 2 horas, perfecta para los entusiastas de la naturaleza. Disfrute de los hermosos paisajes de Banff por la noche mientras busca de alces, ciervos, osos y más, ya que cada excursión tiene una tasa de éxito del 95 % de avistamiento animal en su entorno natural. También, gracias a su guía experto, aprenderá acerca de los esfuerzos del parque por proteger a los animales y su hábitat. Aprende sobre la fauna local y los esfuerzos de preservación con un guía experto. Este safari por la fauna y flora de Banff es la oportunidad perfecta para descubrir las increíbles criaturas del parque durante su mayor actividad nocturna; todo en contraste con el hermoso paisaje de las Montañas Rocosas canadienses. Después de una recogida a primeras horas de la noche en Banff, se dirigirá al parque con su guía. A medida que la excursión atraviesa los diversos paisajes montañosos del parque, mantenga los ojos bien abiertos para observar animales como ovejas, alces, ciervos y osos mientras comienzan su actividad nocturna. Su guía compartirá detalles adicionales sobre estas increíbles criaturas y su hábitat único, también le hablará sobre el desafía que representa tratar de protegerlos. A continuación se realizará una parada en una mesa interactiva para ver objetos y artefactos raros relacionados con los animales. Al final de las dos horas, se le dejará en el centro de Banff, a donde llegará con una nueva apreciación y comprensión de la increíble fauna y flora que llama hogar a esta zona. Nota: esta excursión es estacional y solo opera de abril a octubre. We had an amazing guide and saw elk, deer and even a black bear! This tour was a fantastic way to see Banff and we highly recommend it! Excellent Tour, saw Bears, Elk and Mountain goats with great tour guide Denise. We went as a family with 2 kids for a 2+ hour tour and had a great time. Very informative tour and the guide Denise kept it interesting and fun for all including the kids. We saw a black bear eating berries, female and baby mountain goats and Elk. It was a beautiful drive and we got to see some cool wildlife. Highly recommended tour for a family. Very enjoyable! Small group, our driver/guide was interesting and courteous. We were fortunate to see several elk, but I am sure there were lots of eyes watching us! The guide we had was really great, cracking jokes all along the way. The drive was lovely - we went to both Lake Minnewanka and the Vermillion lakes. We saw a couple of elk - one a mother with a fawn, which was great, and then a deer, but that was pretty much it. Had better luck seeing bears on our own, the following morning driving along the Bow Valley parkway. Didn't see much wild life. Nothing exotic anyway. Elks, Moose and mountain sheep were sighted during other day tours as well. Although tour guide was very friendly, I would not recommend this tour if you actually want to see some wildlife. Seeing wildlife is never a guarantee, however when you are told 5 minutes into the trip that you have more luck winning lotto than seeing a bear and there is no wolves in Banff because they had to shoot them last year did not leave high expectations. We then drove over 45 minutes to arrive at this open field to only meet another tour guide who had a table with elk horns and skins and gave us although informative talk about the wild life you would normally see here but they don't expect today. We then drove back the 45 minutes into town and drove up to a look out over Banff must say beautiful view but then again not expected to see wildlife here today As previous mentioned, tour guide was very informative and spoke with great knowledge of the wild life however, it was very clear to everyone on board that even he, did not expect to see any wildlife from the beginning of tour and basically just took us to places to fill in the the time. Believe tour should have been promoted as a wild life conservation tour, rather than a safari especially at this time of the year, when the company knows sightings will probably not occur. May I add, won lotto the next day seeing a black bear along the road way. This Evening Wildlife Safari far exceeded expectations! Our guide was super-knowledgeable, well-spoken and knew just where the best viewing spots were. We had several opportunities to get out to observe some of the wilderness and at one point, were giving a talk from two naturalists! I did report to Viator that the tour was TWO hours, not one hour, so even more worth the money! Great bus too - large viewing windows! Highly recommend! This was a great adventure! Aaron was fabulous-- very knowledgeable and funny and warm. He took us to all the great animal spotting locations and taught us so much about conservation. We loved it! An enjoyable experience - convenient pickup and drop off once we had located the Sundance Mall where the tour company is situated. The tour guide was informative and gave us lots of information about the area as well as wildlife. 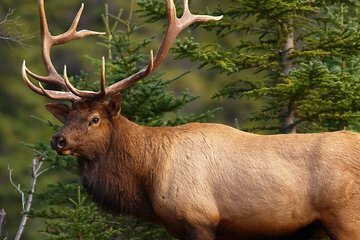 It was the beginning of the mating season and we saw two rutting Elks which he said was a very rare experience and we also saw some white tailed deer - no bears though but the little talk at the end of the tour when we view the bear skin was quite amusing.